The sweet sounds of the ’80s will come roaring into Petco Park this summer like a 2-run bloop single off the bat of a young Tony Gwynn, when Def Leppard and Journey join forces for a blistering 58-city tour that stops in Petco Park on September 23, 2018. For the San Diego show, Def Leppard will be headlining. Journey is going on first and Def Leppard will be closing the show. For the Journey / Def Leppard concert, the stage will be in centerfield facing home plate, and additional sections have been added on the field. Sections A3, A4, A5, A9, A10, A11 right in front of the stage. A1, A2, A8 are just to the left. A6, A7 and A12 are to the right. View the full seating chart. If you have never heard of Journey or Def Leppard, well you have a lot of catching up to do. In fact its hard to even know where to begin. Journey are the ones who sing “Don’t Stop Believin’” Def Leppard “Pour Some Sugar on Me” “Photograph” “Rock Of Ages.” Tossing out #1 albums as effortlessly as stadium peanut vendors, hundreds of millions sold, rock & roll hall of fame, walk of fame, etc. Are you sure you never heard of them? Didn’t you have a roommate in college? Who is opening for who in San Diego? What time are they going on? This is a co-headliner tour with rotating order. Each band has been playing approximately 16-18 songs each. 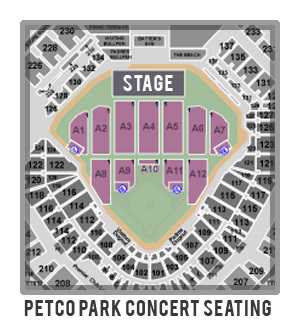 For the Petco Park San Diego show, doors open at 4PM and the show starts at 6PM. The Padres will be on a six-game roadtrip in LA and San Francisco while the tour is in town. The Journey / Def Leppard show is one day after the Eagles concert at Petco Park.